Wax Love present a reissue of In Milan, a live performance from Chet Baker, originally released in 1959. The king of West Coast jazz caught in Milan during his first European trip. The band assembled for these sessions features some of the best Italian classic jazz musicians of the time. The basic quartet includes Chet Baker (trumpet), Renato Sellani (piano), Franco Cerri (bass), and Gene Victory (drums). However, that unit is often upgraded to a sextet with Glauco Masetti (alto sax) and Gianno Basso (tenor sax). The cool spirit of Baker's music lives through some inspired fluid performances of American bop classics such as Miles Davis's "Tune Up" and Charlie Parker's "Cheryl Blues". "Star-crossed jazz musician Chet Baker's dreamy, relaxed stylings have won him a well-deserved cult following, and this classic 1954 set represents a critical high point in the development of the West Coast Cool jazz movement. Baker painstakingly crafted a lush set of exquisitely delivered standards from the Great American Songbook, and each is put across with the sensitivity and interpretive prowess of a true jazz communicator." Wax Love present a reissue of Chet Baker's It Could Happen To You, originally released in 1958. It Could Happen To You follows a similar style to his previous vocal records in which he updates old standards to a contemporary cool jazz setting. Unlike previous releases, by 1958 Baker's voice had reached a stunning maturity and his trumpet playing is also at a near peak in quality. The song selection is impeccable and everything about this record just oozes coolness. One of the finest releases in Chet Baker's storied career. 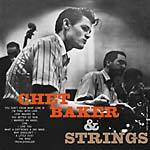 Wax Love present a reissue of Chet Baker's Chet Baker & Strings, originally released in 1954. Recorded in 1953 and 1954 with a veritable who's who of West Coast cool jazz including backing from Zoot Sims, Bud Shank, Shelly Manne, as well as arrangements from Jack Montrose and Shorty Rogers, Chet Baker & Strings is a beautiful and airy collection of some of Baker's most sultry trumpet work. The string section perfectly complements the cool jazz quintet backing and makes this one of the Baker's finest and most unique sets. Essential. Wax Love present a reissue of Chet Baker Sings, originally released in 1954. Chet Baker was the very definition of cool and this 1954 release, which introduced the world to his unique jazz vocal delivery, is arguably the finest work of his career. His vocal style possessed a clear, pure tone devoid of vibrato, similar to his trumpet playing, and was just as revelatory. This album is a landmark of west coast cool jazz perfect for those late, smoky nights, and an absolute essential for any fan of the late great Baker.